Is it possible to be fit and overweight? If you exercise and are overweight you are better off health-wise than if you are thin and idle. Achieving cardiovascular fitness through exercise means obese persons can have better health outcomes than lean people who do not exercise. Unfortunately the primary goal is often weight loss and that is not enough incentive for many new exercisers to keep up their fitness endeavours. Possibly because it doesn’t achieve their objective quickly or perhaps they feel they should lose weight first before starting to seriously exercise. Along with the battle of the bulge lies the battle of restrictive thinking. To ‘exercise’ does not mean jumping up off the couch one day and having to participate in some heavy activity like lacrosse, soccer, or transforming into a muscle bound bodybuilder. Exercise encompasses all physical activity and could include walking, cycling, and swimming. Any activity can be quickly adapted into our lives. Walking down to the shops, gardening, playing golf (no electric cart), dancing, and housework are forms of physical activity that all count towards a healthy, active you. Being overweight does not bar you from participating at the gym or a local sports center. If you think you will feel self-conscious or look like a neophyte or you are concerned about not being able to participate. Take a moment to inquire into the facilities available. Likely there is swimming, aqua aerobics, static bicycles, rowing machines, beginners exercise classes and many other activities designed specifically for the novice exerciser. Embrace physical activity as a means to health and cardiovascular fitness as opposed to just using it as a weight loss tool and free your mind from all your old negative thinking habits. Once you become more active you may wish to continue to increase your level of fitness. If walking is one way you had chosen to become more fit you can use a pedometer to track your participation. It will encourage you to hit those 10000 steps Pedometers can be found online and at most retail and fitness stores. Basic models cost less than $20. It measures how many steps you are taking, adds them up and tells you at the end of the day how many steps and how far you walked. A common goal is 10,000 steps each day to help maintain a healthy level of physical activity. If you’re curious about calories burned or want the ability to upload your walking data to electronically track the numbers, you might prefer a fancier model. 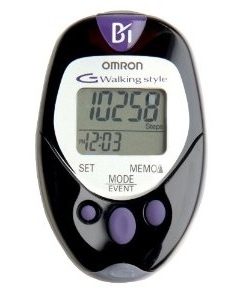 A pedometer provides customized feedback on your activity level and a reminder to keep walking. Look for one with a display monitor you can read in different types of lighting without your reading glasses. Choose a lightweight model to fit on the type of clothing you usually wear. Be sure to get one that comes with a sturdy clip and a security strap to hold the pedometer in place. Start by wearing your pedometer throughout the day for three consecutive days. Add the total number of steps for each of the three days together and divide by three. This gives you a starting point so you can start setting short- and long-term goals. A short-term goal might be to add a certain number of steps to your daily routine and a long-term goal might be to walk 10,000 steps a day or make 3,000 of your daily steps fast paced. Use your pedometer to set and track realistic goals based on your fitness level. Remember; whatever your goals, take them one step at a time.